If there’s one thing on this earth that we love above anything else it’s food. It doesn’t matter whether we’re eating it, smelling it or watching videos of it in Instagram, we love checking out new dishes and stuffing our faces whenever we get the chance. Living in a van doesn’t mean that you have to eat pot noodles or trail mix, in fact with the right equipment you can cook up a storm for you and your friends no matter where you are. We’ve compiled a list of the Top Cooking Accessories that you need on your adventures; from Calzones to Curries, these van life cooking essentials will see you eating 5 star cuisine no matter where you are in the world! Top Cooking Accessories For The Ultimate Van Life Cookout! The XL RidgeMonkey Toaster is without a doubt one of the best items that we have in our own van. If you don’t have an oven then this is one of the Top Cooking Accessories that you need in your mobile kitchen. Originally designed for fishermen to cook their catch on the job, the RidgeMonkey is an amazing bit of kit that you can cook all sorts in right on the top of your hob or gas burner. So far since owning our own RidgeMonkey we’ve cooked Calzones, Lasagne, Veggie Burgers, Kievs, Tacos, Sausages, Omlettes, Roast Potatoes and many many more things that we thought we would never eat again once we moved into our van (as an Italian I cant go 3 days without eating pizza or lasagne). The RidgeMonkey series also boasts a smaller portable toaster and a Combi Connect grill that has seperate sections for all of your camping breakfast needs! To check out more information and to buy your very own XL RidgeMonkey click below! Looking for a Fire Pit to cook some juicy steaks or sumptuous Halloumi slices on your next Van Life Cookout? The BioLite Fire pit is one of our Top Cooking Accessories for the ultimate off grid camper, and not only that, it keeps you warm all night long! Burn wood or coal in the BioLite Fire pit, and then control the flames from your sleeping bag via bluetooth using an app! Off Grid Living is simple when you know how! Say goodbye to smoke and say hello to 360 degree heat and a safe alternative to your home made forest bbq. Check out our full article on the BioLite Fire pit here, and click below to purchase yours! If the BioLite Firepit is a little bit too extreme for your camp out needs then the BioLite CampStove might be the gadget for you. You can also turn fire into gadget power and charge your tech whilst you boil your kettle, making this one of the Top Cooking Accessories around and an all-round legendary bit of kit. You can pretty much burn anything inside this Camping Stove, meaning that you wont have to forage around for hours for fuel on an empty stomach. LED indicators keep you in the know about your devices fan speed, heat and charging status, and a you can see from the picture above that you can cook and heat a variety of items with the compatible additional extra from BioLite. Check out our full length article on the BioLite CampStove here, and then click below to purchase your own! Do you have your own kitchen inside your camper? Perhaps you’re a weekend warrior who doesn’t have a lot of space inside your rolling home, or maybe you just prefer cooking outdoors because you always burn the bacon? If you fall into any of those categories then the iKamper EatOut should definitely be on your list of Top Cooking Accessories. This little box turns into a fully fledged kitchen work space with storage options and a gas hob for you to cook outdoors. 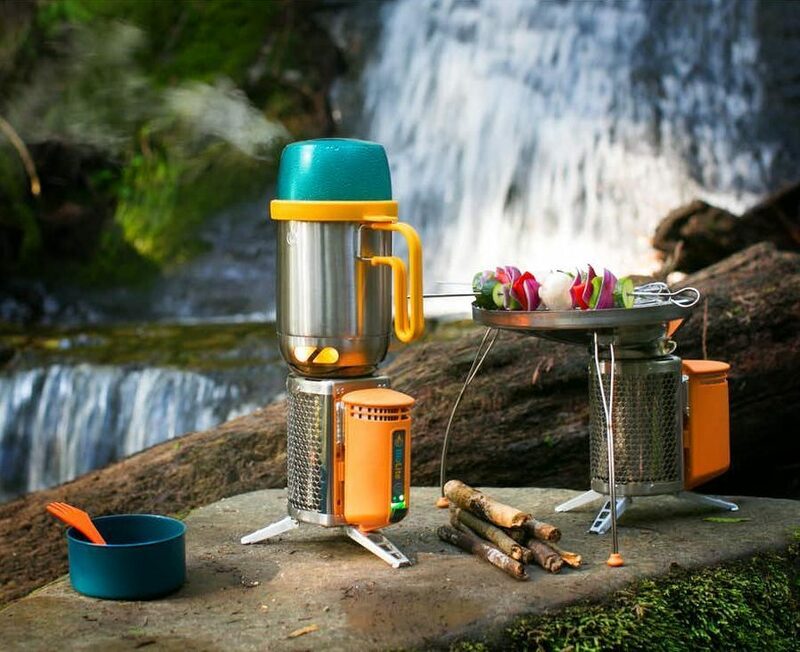 Team it up with the BioLite CampStove and you can start up your own forest restaurant worthy of Carluccio himself! Store your food in it on the way to the campground (no more squashed mushrooms) and once everything’s cooked the iKamper Eatout folds out into a table that can comfortably seat four people – living off the grid just got a whole lot easier! Check out our full length article on the iKamper EatOut, and then click below to get a slice of the action! Are your crew members getting tired on the road, or maybe you just love that coffee fix first thing in a morning? The Wacaco portable espresso machine is small enough to fit inside your rucksack and gives you delicious tasting coffee no matter where you are! The nanopresso is capable of reaching 261 psi and holds 80ml of water. It’s simple to use and protected by the detachable cup. What more could a coffee-loving-camper need! Click below to find out more about the Wacaco Portable Espresso Machine and to purchase your own! More Top Cooking Accessories For Off Grid Food Loving Vandwellers! We just stepped camp fire cooking up a notch. If you want to make van life stories about your cooking that will still be told generations after you serve your meal then the Codac 2-Cook Deluxe Light is the gadget for you. The 2-Cook is a lean, mean cooking machine with a number of different variations to help you cook the prefect meal. It’s small and lightweight which makes it perfect for taking with you on the road. It has two burners with automatic ignition, two pan stands, and a removable flat and ribbed hot plate for cooking fish, meat and some sumptuous veggies. Cadac use ‘Green Grill’ coating which is environmentally friendly and non toxic, so if you class yourself as one of Van Clan‘s Top Eco Campers then this should be on your list of Top Cooking Accessories! To find out more about the Codac 2-Cook Deluxe Light click the button below! Every good superhero needs a utility belt, and every good off-grid chef needs tools that can help him or her whip up a tasty treat to keep you going on your adventures. 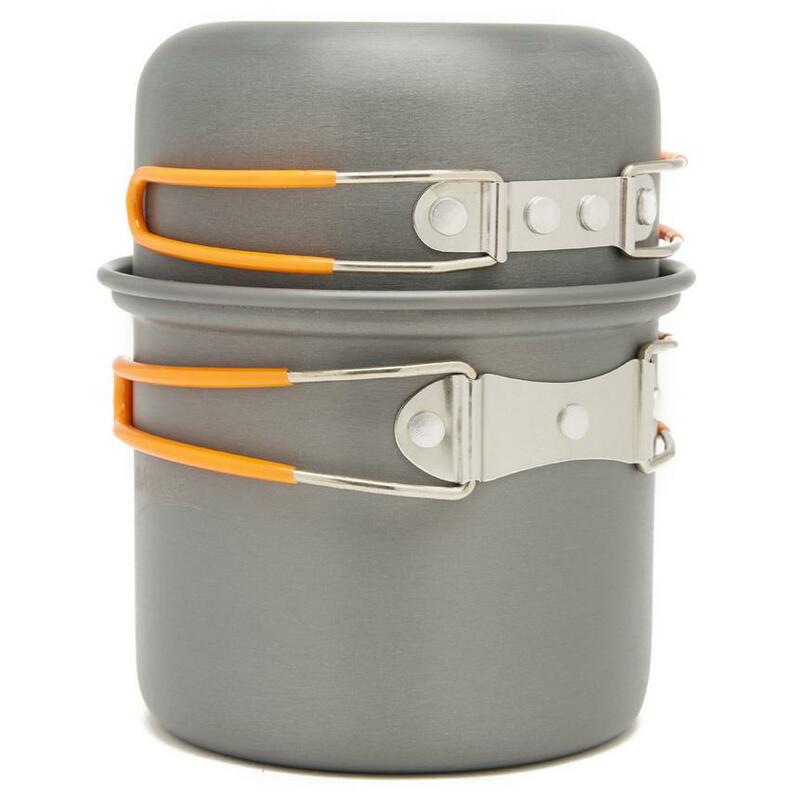 This Campfire Prep Set from Primus has made our Top Cooking Accessories list because it’s versatile, it packs up small and it’s got everything that you need to whip up a meal without bringing the kitchen sink along for the ride. 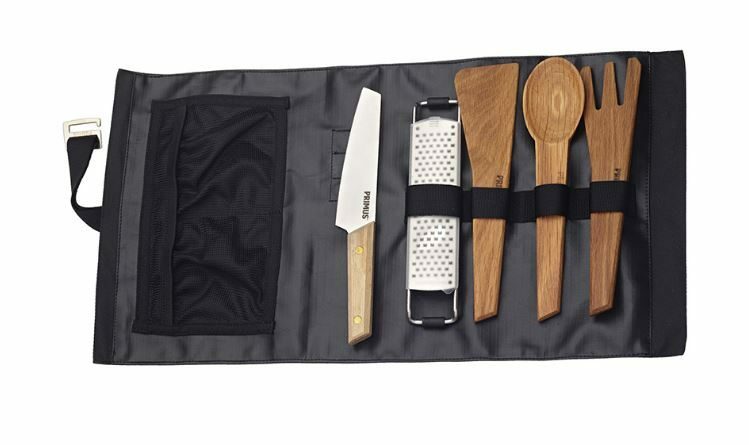 The set contains a 12cm flexible stainless steel knife, an oak spatula, fork & spoon (a perfect eco combination, expecially if you’re rocking up to the party in an electric campervan) and a stainless steel grater. It all comes in a tough roll up case that you can hang from a hook or handy branch too, keeping your cooking utensils neat and tidy, just like life should be! As travel gear items go, the Primus prep set is a must have. 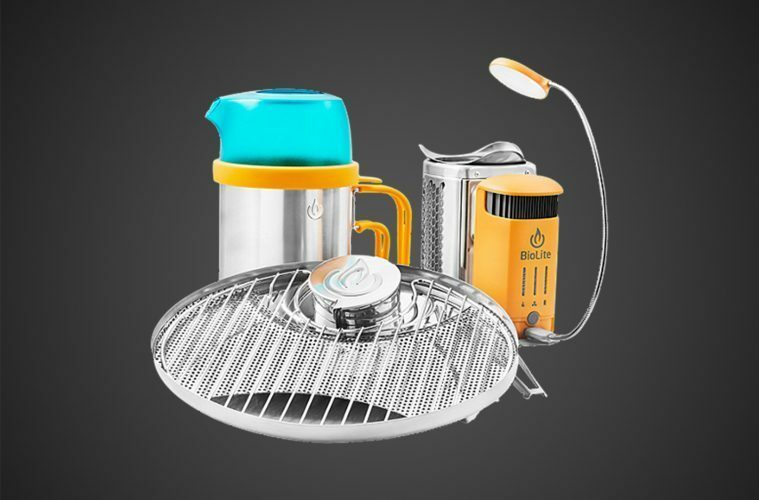 Check out the Primus Campfire Prep Set below and treat yourself to some proper chef’s tools! If you want to take your campground food prep one step further then you might want to consider packing the Zyliss Easy Pull Manual Food Processor, a must have if you like your onions small or if you want to make up a batch of Guacamole on the go. This hand held chopping robot is one of our Top Cooking Accessories because it can cut down food prep by half, and it also makes you look like a maser chef in front of your friends and family. There’s no need for electricity with the Zyliss food processor; just pull the hook at the top and experience fine cut food in seconds. If you want to push the boat out even further you can get the handheld garlic press and cheese grater too. 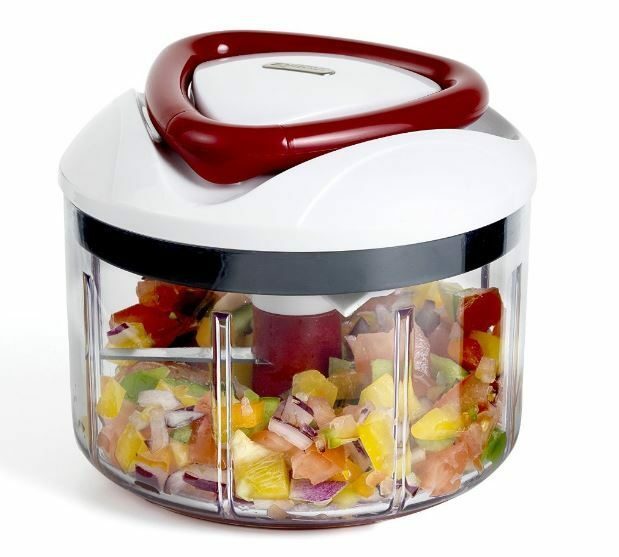 Grab your own Zyliss EasyPull Manual Food Processor below! “Pours like a kettle, cooks like a pot” – that’s what they said about Muhammad Ali, right? You might have seen the BioLite KettePot in previous pictures, but it gets its own spot in our Top Kitchen Accessories because its a super useful bit of kit than will really help you out if you’re short on space. Cook soup, make tea, stew meat or whip up some noodles, the stainless steal pot can be used for all sorts of kitchen shenanigans. 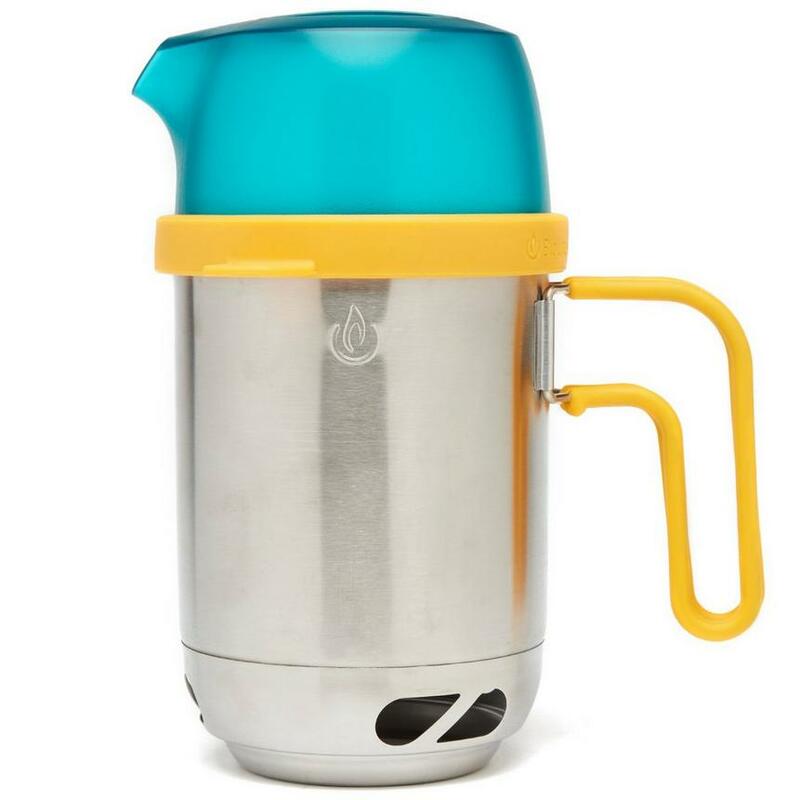 Place the kettle lid on top to pour soup or water to enter ‘kettle mode’, and the sturdy insulated handle means that you wont burn your hands whilst handling. Click below to check out more about the BioLite KettlePot and to buy your own! Add the CoffeePress attachment to turn the KettlePot into a Coffee Percolator! This simple, stackable pan system from Vango comes in at Number 10 on our Top Cooking Accessories list. It does exactly what it says on the tin (a hard, anodised non-stick tin at that!) and packs away neatly to fit in the smallest of rucksacks or van drawers. Two sized pans are enough if you’re a mountain man or a solo female vanlifer and you’ll just have to hope that your friends have their own pans if they come round for tea! Click the link below to find out more about the Vango Hard Anodised One Person Cook Kit! Everyone knows that you can’t cook without tunes in the background. The Anker SoundCore is one of the best Bluetooth speakers that we’ve ever used, with great rich tones and a battery life that you have to experience to believe. We use ours quite regulary in our own van and the last time we charged it up was when we left our terraced house in October 2017. It’s now the end of July 2018 and it’s still going strong. If that isn’t enough to make you buy one then I don’t know what is! The Anker SoundCore is loud for its size and small enough to stick in a bag or hide in your picnic basket, plus its perfect for those Best Road Trip Songs. At £29.99 we can’t recommend a better speaker for the price. Click the button below to add this to your Top Cooking Accessories amazon basket and press purchase! Thanks for checking our our list of Top Cooking Accessories. I hope that some, if not all of them will help you the next time you whip out your ‘kiss the cook’ apron and set too preparing a sumptuous feast for your friends and loved ones.